We offer an ethnographic description of the circulation of vegetables on the border between Mexico and Guatemala. These goods move from one country to the other through ant-style piecemeal trafficking on misdirected paths: they enter constantly as contraband in small quantities, using tolerated border crossings. The objective is to show how the interactions between the border actors involved construct a local order that is different from that of the State’s normative parameters. An order is founded on a series of unwritten rules that govern the practices of crossing, thereby creating an “interpretive community.” This paper clarifies why the operating personnel from different levels of the Mexican government charged with overseeing trade are not outside of this community but rather compose an important part of it and how the State is empirically constructed within it, starting from the idea that the State is not an all-encompassing and coherent entity. This article offers an ethnographic description of the regulation of local vegetable commerce on the border of Mexico and Guatemala.1 Currently, one of the principal commercial activities between Soconusco, Chiapas, Mexico, and the southwestern region of Guatemala is the flow of fresh vegetables from Guatemala to Mexico. This type of commerce circulates from one country to another through misdirected paths using “ant-style trafficking”; that is, these products enter as contraband in small quantities but constantly, using tolerated border crossings a few meters away from official border entries. The article starts by describing the mechanisms of border crossings by merchants and products, with the objective of showing how a local order, different from the normative parameters of the State, is constructed through the interactions of the border actors involved. The study was developed between 2011 and 2015 at two border crossings, the first between Tecún-Umán (Guatemala) and Ciudad Hidalgo (Mexico) and the second between El Carmen, Guatemala, and Talismán, Mexico, in addition to the city of Tapachula.2 Using the technique of participatory observation and interviews regarding commerce, we gathered evidence about the existence of a local order that is not officially recognized, permitting the exchange of goods, in which, paradoxically, the operative personnel of Mexican government institutions participate, the same people who, in principle, are charged with imposing official order on the border region. This paper shows how the practices of the government bureaucrats and personnel are substantially different from the normative discourse of the legal order that they expound or on which supposedly state logic is based. We argue that, in their practice as public servants, border police, or phytosanitary supervisors, they reinterpret or modify the normative order or that they even adapt themselves to the regional criteria for commercial border trafficking, thereby contributing to the creation of a de facto order, the order experienced daily in commercial flows. Our approach to the concept of the State comes from the ethnographic method, and therefore, it is an empirical-type descriptive vision. That is, we disagree with the approach of versions that start from the idea that the State is the historical result of a social pact in which citizens, through their own will, recognize the existence of political leadership, its moral authority, and its laws and act as the principal guardians of this order (Lagi, 2011, p. 5). Similarly, we distance ourselves from versions that view the State as a bureaucratic body that is sustained by knowledge from which flows a rational administration of power (Mathews, 2006, p. 136). Rather, the ethnographic data tend to suppose that the State is not a bureaucratic apparatus characterized by a rational logic that is supported by homogeneous proven technologies of power, nor does it possess unconditional legitimacy from the citizens who comprise the political community. We show that there is a regional configuration of the State that responds to the local context and that is founded in the recognition by the subjects along the border that there is a de facto order that is guided by unwritten norms of trafficking, norms that are recognized as valid both by the merchants dedicated to the ant-style piecemeal trafficking and by the bureaucratic and operative personnel of the Mexican government. This article presents how the government at different administrative political levels, through the time at which this research was conducted, had not been able to generate a consensus among the border population with regard to their exclusivity or their unambiguous power in the binational control of the commercial flow. In this border context, we deduce that the State’s capacity as a general regulating force is not founded on the application of its regulatory laws (normative framework) or on the consensus that its legal categories could have among the border population but rather on its legitimacy as a moral authority to manage order starting from its operative personnel, whose labor consists of listening to the perspectives of the different groups involved and fighting with each other, interpreting them, and establishing accords with the intention of maintaining flexible legal codes with regard to the tolerance of commercial vegetable crossing. The purpose of this article is not to judge the State’s lack of efficiency as a government in its role as an ordering force of the commercial flow but rather to make evident how order is produced from the everyday relationships between the different groups of local power, local bureaucracies, and the operative personnel of different levels of government. To understand the connection between the border and the production of the State in this context, we first define what we mean by the “State,” the border, and border commerce. In this exercise, we suggest the existence of an interpretive community of what is introduced as the activity of ant-style trafficking, which is a series of unwritten norms that all involved recognize as valid. Once this notion is defined, our analysis aims to clarify how the interactions of the actors in the framework of the community are established. To that end, we generally contextualize the border commerce activity and then present ethnographic data detailing who is involved and what their activities and mercantile strategies are. Subsequently, we analyze two levels of the local order in which the interpretive community is evident. Upon examining how the local order is negotiated at these two levels with their respective actors and strategies, we aim to clarify the form in which the State is configured at the regional level and, in parallel, suggest how this configuration is the principal element that sustains the flow of vegetables through ant-style trafficking. As noted in the introduction, we start from a critique of normatively focused analyses of the State that take its actual existence as a universal fact, especially in its function of “what should be,” and therefore, when describing actual articulations of powers with the State, they are branded as anarchic power relationships on the margins of the legal sphere. These analyses offer traditional dichotomies between formal-informal, licit-illicit, and the subsequent corrective prescriptions to eliminate anomalies and direct informality towards formal paths (Ordóñez, 2007, p. 98). We would also like to differentiate ourselves from an ethnographic position in which contraband is analyzed as though it were an alternative project, justifying it as a basic right of the population or even as free trade without government intervention, interpreting it as an act against hegemony that is consciously organized from a global civil society resisting the laws of a neoliberal State (Galemba, 2011, p. 340). In this type of research, the agency of the merchants stands out, given that they are social agents who act in full political conscience. The premise from which we start is that there is no such political conscience on the part of the border merchants, with the exception of their union leaders, nor is there an all-embracing power that produces a “homogeneous social order” or “coherent bureaucratic apparatus” (Escalona, 2011, p. 48). Rather, as Philip Abrams (2000) proposes in his “Notes on the Difficulty of Studying the State,” we suggest the idea that the State does not exist as a concrete, coherent, and all-encompassing entity; rather, there is a state-system as government, and a myth about the existence of a State which is legitimated in society by diverse forms. This idea, on the one hand, is sheltered within the illusion of representing supposed universal moral values (democracy, equality, justice, impartiality); simultaneously, on the other hand, it appears to us as a concrete matter that is separate from society. In accordance with our understanding of the context in situ, the function of the State as government is based on its role as a manager in representing the State through its operative personnel and mid-level managers. These are the health and customs officials who manage the local order together with other power groups. However, as Abrams (2000) correctly describes, it is also the discourse of the same personnel that contributes to the mythical creation of the State as a force of general power. In this manner, we have a double usage of the figure of the State: in discourse and in practice. In discourse, it is fetishized for its image of representing the general power that is materialized through the mechanisms of border control as a bureaucratic, political, and police apparatus as well as through its physical infrastructure, such as inspection buildings, official entry points, patrols, oversight points, mobile laboratories, which, from the perspective of the border residents, act as a symbolic referent to say: “That is it, and there is the State.” In contrast, in practice, the establishment of commercial order is something that is contextualized, constructed, and performed through permanent disputes between different power groups. In conducting an ethnography of the border order, we emphasize the discourses and practices of both the government personnel and the other power groups involved. The aim is to clarify the analytical strategy that we follow, which we take from Das and Poole (2008), who suggest distancing ourselves from the consolidated image of the state as an administrative form of rationalized organization that tends to weaken itself or break itself up along territorial and social (2008, p.19); more precisely, they reflect on how in the development of daily life, political practices of regulation and discipline that constitute what we call the State are molded (2008, p. 19). Once again taking up the suggestion of Das and Poole (2008), we present how border vegetable trafficking from Guatemala to Mexico is sustained in an interpretive community (Stanley Fish, cited in González, 2009, p. 234). We refer to the premise that there is a comprehensive common background of unwritten rules that guide the commercial practices of border subjects. For example, these range from the use of linguistic expressions of legality and morality (“crooked”-“straight”) to very specific strategies for goods crossing through ant-style trafficking. Naturally, this interpretive community is not free from reinterpretations by the same actors who validate it because it is based on the pre-understanding of a system of unwritten rules that are assumed. Part of this ambiguity in the interpretation made by the border subjects, despite believing that the rules of the interpretive community itself are valid, concerns the fact that when exceptional circumstances present themselves, there is a tendency to reinterpret at their convenience, be it in explicit political negotiations or in the reproduction of everyday commercial practices. To illustrate more simply the interactions between the different actors involved in the framework of this interpretive community, we present the border context as though it addressed an arena in which political-commercial practices developed through explicit and symbolic forms of power, with the intention of exercising, controlling, and regulating the flow of vegetables. Some actors involved are part of power groups that reinterpret and direct the comprehensive common background of unwritten rules in their favor. The arena is the border space where there are disputes over the control of trafficking, whose intention is to remain in the profession, to dominate, and to impose meanings to guarantee the most convenient order for each of the groups involved. Here, the hierarchies of each group are measured in relation to others who also want to negotiate the local order. In accordance with this heuristic resource designed by Arjun Appadurai (1991, p. 33) (based on his reading of Pierre Bourdieu), it must be made clear that the power groups (retail traders, businessmen, shippers), the operative personnel, and the local bureaucracies, before disputing and negotiating the local order, have a pre-established position, a product of a combination of factors such as the preponderance in the commercial sector, the local social stratification, the ethnic group to which they belong such as: the type of goods trafficked, the quantity of goods, the mechanisms of crossing, and the political or public position held. That is, the groups that confront each other already have hierarchical positions that are more or less established and recognized, and these situate them beforehand in better or worse positions within the border arena: Guatemalan vegetable traders who cross with their small quantities of goods three or four times per week will not carry the same weight in negotiations as the stock-keeper who traffics five to ten tons of vegetables per day. To show the construction of the local order in light of this heuristic resource known as the arena of disputes, in the following section, we detail some general characteristics of border commerce and of each of the groups involved. Doing so provides us with an idea of the positions that they occupy in the commercial context of ant-style trafficking and also presents evidence concerning the manner in which the State is configured from these practices and on exactly which unwritten rules the community is based. On the bridge that joins Talismán, Mexico, with El Carmen, Guatemala, there is a constant flow of people. People on tricycles, women with grocery bags, and farmworkers head towards Mexico. Below this formal admission path flows the Suchiate River, the natural demarcation separating the two countries. In plain sight of everyone who works or transits along the sidewalks of the bridge, one can see the transfer of vegetables towards Mexico. They are packaged in Styrofoam and transported by people swimming, hanging on a zip-line, or even on the tire of a tractor. In the following section, we list the actors involved, their activities, and their positions within this activity. Vegetables are transported in the Guatemalan territory, both by private freight services and in passenger trucks that reach the border crossing at Carmen. Freighters known as “divers” transport the goods from this terminal, cross the river on foot or by zip-line, tying the goods with a sash or a leather strap, and leave them some meters beyond the official entry point of Talismán in Mexico. At that point, tricyclists from the Mexican side carry the goods and load them onto freight or passenger trucks, where some minutes later the vendor also boards to head to the market of San Juan in Tapachula. While this activity is occurring below the bridge, in the immigration checkpoints, the vendors cross legally and show the official their local pass,4 and sometimes, they greet them as though they have known each other for a long time. The labor for this type of vegetable trading is performed among all of the members of an extensive family (parents, children, cousins, grandchildren, nephews, etc.). These are family groups that originate from sections and towns in the department of San Marcos, Guatemala. All of the subjects with whom we were able to talk are bilingual; they speak Spanish fluently, and they use the Mam language with their fellow countrymen. In accordance with our observations, it is the women who organize the work of the family group and who manage the money. Specifically, during the fieldwork, a friendly relationship was established with the family group of Ms. Carmen (approximately 50 people). In 2011, this woman was 51 years old and traveled three times per week between her hometown, San Andrés Chapil, the market plaza “del Mosquito” in San Pedro Sacatepéquez, the border crossing of Carmen-Talismán, and the San Juan market in the city of Tapachula. Another method of introduction is through providers. These are distribution chains of vegetables in bulk with a binational operation, connected through shipping, warehousing, and logistics services on both sides of the border. In the Tapachula markets, vegetable orders are taken by young Guatemalans aged 15 to 18 who work for stock-keepers from Tecún-Umán in Guatemala. Their work consists of listing the types of vegetables, the price, and the quantity and writing down the order in a notebook. They send this information to the stock workers through cell phone messages, and in 2015, they were using the smartphone application WhatsApp (Personal observation, March 2015). In the warehouses located on the Guatemalan side, barely 700 meters from the official border bridge, the orders from the Tapachula clients are prepared as requested. 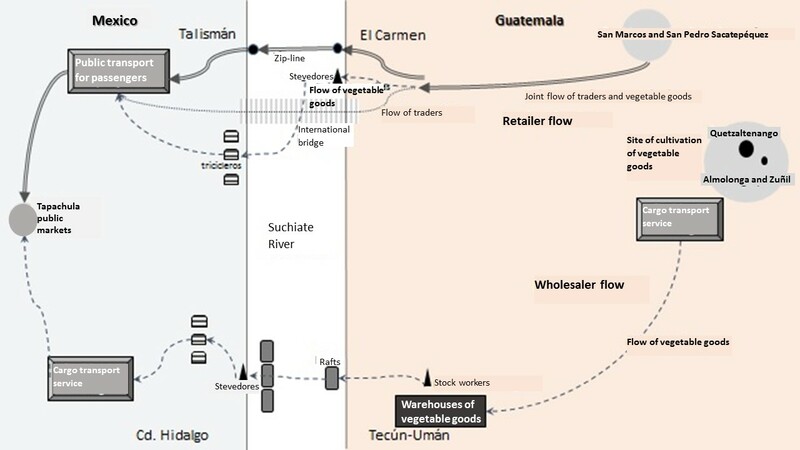 In this place, there are a series of employees to pack up the vegetables and prepare them to be transported to the dockworkers; there, they await several rafts connected to Mexican unions to take them to the other side of the river (Figure 1). Source: Created by the authors based on field notes. The owners of the warehouses are family groups that are politically and economically powerful in the local scene of the Suchiate and Tecún Umán. In 2011, four warehouses were counted, and their owners were municipal ex-presidents from Suchiate (that is, they operate binationally), ex-union leaders, and their family members, who, in addition to being up to date with the municipal political power struggles, dedicate themselves to marketing considerable quantities of vegetable products, in addition to other manufactured goods. As a group, they work using bulk distribution chains with a binational operation connecting shipping and logistics services on both sides of the border based on family relationships, political pacts, friendship, and, naturally, the recognition of an interpretive community that manages the same linguistic expressions on morality and legality. I want both countries to progress because I have family on both sides of the border. Ciudad Hidalgo and Tecún Umán are sister cities where people maintain blood and family ties. Everyone who lives in these towns, their life is the commerce performed through the misdirected paths, so the goods that circulate from here to Tapachula, even if it’s thought to be illegal, it’s secondary for us. What is illegal is viewed that way only by the federal government, to charge more taxes in their customs. That is secondary here because it is about a straight activity from which all of us—rich and poor—put food on our tables in these two sister cities… What we trade are primary goods that maintain prices that are accessible to people who have fewer resources (Ovando, 2015). Javier Ovando has been the councilor of the municipality of Suchiate; currently, he calls himself a businessman because he is part of a recognized regional business chamber integrated into the Confederation of National Business, Services, and Tourism Chambers (Confederación de Cámaras Nacionales de Comercio, Servicios y Turismo–Concanaco Servytur); in addition, he is a local leader of the Green Party of Mexico and, previously, the Institutional Revolutionary Party (field notes, 2015). The “rafters” serve to transport the vegetables from one side of the Suchiate river to the other, in this case, from the Guatemalan side to Mexico. At first glance, one would think that the tricyclists and the rafters are free agents offering their services; nevertheless, all of the rafters and tricyclists with whom we had the opportunity to converse during the fieldwork are grouped into unions that are incorporated into the Confederation of Workers of Mexico (Confederación de Trabajadores de México–CTM) or the Regional Mexican Workers Confederation (Confederación Regional Obrera Mexicana–CROM). The owners of the warehouses also have a very active political life as members of political parties on the municipal level. In Ciudad Hidalgo, these service workers openly recognize their affiliation with the Institutional Revolutionary Party or the Green Party of Mexico as well as with the unions. The political position and the position of power occupied by these people are very limited compared to those of the stock-keepers. The tricycles also serve as means for publicizing political propaganda, and they are the base for generating corporate votes for specific candidates. The salary is for rent; you pay 100 pesos daily for the tricycle, and the rest is for us. The boss puts propaganda and invites us to participate in Party activities, discounting that day’s rent. Other colleagues, whom the bosses have worked with for more time, become unionized, and they’re allowed to work with tricycles or catarinas [mopeds for freight and passengers]… so, there isn’t much else but to belong [to the union] and to vote for the one they tell you because it is practically impossible to work without a political or union preference (Antonio, 2015). The “freighters” are grouped into different local unions, which are all openly connected to the Institutional Revolutionary Party. In the offices of a famous freighters union from Suchiate located in Ciudad Hidalgo, upon asking their representative who are the people who compose the union, he argues that all of his colleagues are from the border zone and more than half are owners. His affiliation is made through a monthly quota, but in exchange, he receives some social benefits; he can transport without being micromanaged, and if necessary, he can receive legal advice (Marco, 2015). In talking with a group of three freighters from this union, they express that the vehicle owners are the people who are affiliated and that they are mere drivers who work for the freight charge. They note that many of the owners are from Ciudad Hidalgo and are also part of the merchant families. What we observed in the commercial life of the border crossings is how the goods (vegetables and groceries) circulate using this type of transport, in which there is a combination of informal crossing mechanisms, but literally backed by formally constituted political institutions, such as unions, political parties, and municipal government authorities. This situation shows how, in this type of border commerce, there is an appeal to the existence of an interpretive community in which the legal-illegal and formal-informal dichotomies are erased (Castells & Porter, 1989). During the research, there was observation at the Suchiate II customs bridge and a series of structured interviews with the person in charge of the Office of Inspection of Agriculture and Livestock Health at Ports, Airports, and Borders (Oficina de Inspección de Sanidad Agropecuaria en Puertos, Aeropuertos y Fronteras–Oisas) of the National Service of Health, Harmlessness, and Quality of Food and Agriculture (Servicio Nacional de Sanidad Inocuidad y Calidad Agroalimentaria–Senasica) belonging to the federal government. The function of these phytosanitary filters located in the duty-free zone, according to the head of Oisas, “is to avoid the ingress of epidemics and/or illnesses that are important for quarantine and thereby to safeguard the public health of our country” (Salazar, 2015). In participant observations conducted during 2015, it was evident that Oisas has a very boxed-in role in regard to the regulation of vegetable foods crossing through ant-style trafficking because there is only inspection control for what passes through the legal crossings: large quantities of goods, be they vegetables in transit towards the United States or to the national market, with their documentation in order, customs order, and laboratory tests of phytosanity previously guaranteed by Oisas. Through these types of specialized legal procedures, a few customs companies that offer management and goods monitoring services gain a benefit, leaving the control of ant-style trafficking to other agents with local power. In addition to taking care of the bureaucratic procedures with regard to the legal oversight of the goods in the duty-free zone of Suchiate II, Oisas has operative personnel located at inspection points next to the official Mexican entry points for migration. Their function is to review people who are suspected of transporting prohibited goods. While they perform this task, in plain sight, one can see below the migration bridges, both in El Carmen-Talismán and in Tecún Umán-Ciudad Hidalgo, the usual circulation of goods. When we asked one of these officials why those goods transit without any control, he explained that those flows have always existed. According to the same person, consumption falls to the sanitary culture of every inhabitant of this city, noting: “As a sanitary official, native to this region, I distribute fliers about the biological risks of this type of activity, but there aren’t enough personnel to entirely prohibit it” (Senasica inspection official, 2015). It is possible that the health inspection points on the highways that connect the border crossings with Tapachula are the only sites where the Oisas operative personnel have direct and daily relations with the vegetable freighters and small merchants. In these same inspection zones, there is typically a customs inspection by the National Tax Administration Service (Servicio Nacional de Administración Tributaria–SAT) and the National Migration Institute (Instituto Nacional de Migración–INM). We have observed how the personnel at the point start from the assumption that those who compose this flow are local residents from the Guatemalan side and are the object of neither migration nor customs (they are not migrants in transit bound for the United States) because the majority of the merchants such as Ms. Carmen have a local pass. The migration personnel perform a visual review and deduce on sight, without a clear criterion, who is a migrant in transit and who is not (field notes, November 2011). With regard to the vegetable freight trucks, at these points, there is seemingly greater oversight. Nevertheless, in the majority of our observations, the freight trucks passed slowly and underwent a visual inspection or a very fast, routine physical inspection. In this sense, the phytosanitary zones represent the rhetorical intention of the State to preserve the security of the national community with respect to external biological dangers, although in practice, their actions regarding ant-style trafficking “are limited with respect to their ambitious ideals” (Mathew, 2006, p. 140; on phytosanitary and commercial regulation, cf. Fletes, 2013a). Rather, in terms of controlling the ant-style trafficking, their role is based on daily negotiations between their personnel, freighters, and small vegetable merchants. If this were interpreted from a normative perspective, it would seem that the relations between these state agents and the various mercantile agents reflect the absence of state control and show acts of corruption against legal orders. Nevertheless, what has been observed is how the State is built based on the involvement of bureaucracies and the operative personnel of the government in “forms of organization thought to be informal or adverse to the logic of the State” (Torres, 2005, p. 268). These mercantile flows of vegetables do not go unnoticed by the workers of the municipal government of Suchiate. They are the individuals who, in the name of the government, offer a sense of security for business for those who practice ant-style trafficking, on the one hand, managing here a type of discourse concerning the meaning of “straight,” and, on the other hand, performing patrols with their municipal police on the misdirected paths. They do not view it as appropriate to classify this type of commerce as “something illicit and damaging to established commerce,” but rather as a usual activity, the product of many years of being practiced and even beneficial to the entire border population. For this reason, the argument of several councilors interviewed during 2015 is that these are “straight activities” and therefore should be viewed as an honest living (field notes, April 2015). One argument expressed on various occasions by these municipal officials is for viewing the border commerce not as a chaotic activity but rather as an economy that is ordered by local businessmen. It is a tolerated activity because it is one of the few sources of employment for the population and, to date, “the [federal] government has not worried” about generating sources of employment that are alternative to this type of activity (Rojas, 2015). Given this scenario, the various spaces analyzed indicate how the municipal government officials ensure that the crossing of edible goods is safe, performing patrols of the misdirected roads, overseeing the prohibition on “crooked” goods, such as weapons and drugs, and establishing base quotas for the freighters and merchants established in Ciudad Hidalgo. In one interview, one of the councilors, who was very close to the municipal president, also expressed something similar to the common stance of all of the municipal officials: “the commerce of vegetables and groceries should not be viewed as something illegal; it is a small-scale flow that is essential for the consumption of the Mexican and Guatemalan population with scarce resources” (Torres, 2015). The police monitor the activity and its normal development, provided that they are not “crooked things,” that is, the trafficking of arms, drugs, or prostitution, because, in those cases, we do not have the power and it is channeled to the Mexican army because [… ] it affects the usual mercantile activity (Jaime, 2015). The use of straight and crooked is generalized, and the criterion is shared in some manner among all of the actors directly and indirectly involved in this flow, including consumers in the city of Tapachula. This contributes to creating a tolerant environment for the commerce of vegetables through the paths noted. For the municipality, if we view it from the perspective of generating employment, services, or revenue, it is a crucial flow. In reality, the municipal authorities themselves tolerate the installation of warehouses at sites close to the misdirected paths and several times per year organize commerce fairs with businessmen from both sides of the border, where the criterion to define formal-informal and licit-illicit is superfluous. The discourses and activities of the actors noted above show what some Guatemalan academics (Arriola, 1995; Ordóñez, 2007) and journalists have begun to call a de facto order: that is, a mercantile operation based on a local order that establishes the manner in which the circulation of goods through ant-style trafficking ought to be managed. This is an order that is not stipulated in any law or regulation but is shared and experienced in everyday life and in which different levels of the government, the border population, and local power groups interact (Mariscal, 2014; Ortiz, n.d.). It is an order that can be interpreted as being beyond a clandestine economy because the State, represented by governmental bureaucrats and operative personnel, influences the daily creation of this order. To precisely identify how and when this de facto order is created and what is the regional configuration of the State, it is necessary to consider that the border actors have pre-established positions in the commercial arena of disputes. These starting positions are asymmetrical, and there are actors such as the operative personnel of the federal government, drivers, and small merchants; all of them generate the de facto order on an empirical and everyday level. In contrast, the stock-keepers, importers, union leaders, and government bureaucrats prepare this order from above; that is, they make political decisions to define the rules, in addition to experiencing it in practice. We believe that the complexity covering the organization behind the de facto order can be exemplified in two levels. The first level is the manner in which this is experienced in everyday life through a philosophy of order, for example, by the small merchants; the second level is viewing this order as a construction of equilibria and asymmetries, a product of political negotiations (explicit and implicit accords) between governments and power groups, whose resolutions are focused on establishing the degree of tolerance for the merchant crossings. Below, we present examples of how these two levels of the local order and its articulation are displayed. The group of actors described above live off the commerce of ant-style trafficking and live in this part of the border, and they classify as “straight” goods all of the products connected to food needs that circulate from one side to the other. Circulation through the transit of perishable edible goods is viewed locally as having the moral condition of being “humanely acceptable” compared to the circulation of other products such as drugs, which the vox populi indicates pass through the same crossing mechanisms; however, they are “crooked,” not necessarily because they are illegal according to official parameters but because they are perceived as being harmful to health. Nevertheless, these moral categories with regard to legality, based on local subjectivities, in certain moments and following the criteria of whoever is using them, often merge with the official normative categories: licit-illicit. What we observed is a framework for malleable legality, used pragmatically. All of the small merchants, the mercantile power groups, and the government personnel themselves, that is, in general, all border subjects who know about these things, use the categories as one of their occupational hazards. The use of the category reflects the recognition by all border actors of a framework of common values, which allows them to give extra-official validation to ant-style trafficking and to generate a common philosophy of legality. For example, for Ms. Carmen, the commerce “as it is” is positive because it favors the economy of “poor people” and lowers the prices of vegetables because there are fewer costs associated with “paperwork.” Nevertheless, when the issue is drugs, in her opinion, “the government should prohibit their circulation because those cause harm” (Carmen, 2011). Daniel, another employee who works in regional coordination for the Secretariat of Agriculture, Livestock, Rural Development, Fishing, and Food (Secretaría de Agricultura, Ganadería, Desarrollo Rural, Pesca y Alimentación–Sagarpa), explained to us: “From the municipality of Motozintla, Chiapas, they bring products such as potatoes; others bring them from the Federal District or Puebla, but due to the cost of transport, they are very expensive.” He believes that Guatemalan vegetables are eaten because they have a cheaper price and the people of the city of Tapachula have become used to them. Regarding the legality of these goods, he comments: “Even if we put more filters and they are viewed as lower quality than the Mexican ones, the vegetables from Guatemala will still be bought due to the low purchasing power of Tapachulans and also because of their lack of sanitary culture” (Daniel, 2011). To show another of the elements of the interpretive community, it is important to highlight how the operative personnel of Senasica and Sagarpa whom we interviewed are native to the city of Tapachula or the adjoining municipalities. That is, these personnel also contribute to creating a tolerant climate because they have a view of the context with regard to the meaning of straight and crooked that is similar to that of the merchants and, in addition, they share the same understanding of the mechanisms of binational traffic. Regardless, they act as friends, accomplices, or allies of the merchants and not only as “guarantors” of the State order. What is exposed is that the dualities —legal-illegal, licit-illicit, crooked/straight— are criteria that are deconstructed in the everyday relations of the actors who share the same understandings and moral values about the flow discussed here. We could even argue that the interpretive community is crystallized directly in the juridical interpretations reformulated in everyday events; in which what is crooked and what is straight have ordering effects that are similar to the categories of legal and illegal. We would like to make clear that, in the interactions between these merchants and the operative personnel of the federal government, when the emic and official categories are simultaneously presented, they are not experienced as dichotomous elements but rather as complementary categories, with more or less validity depending on circumstances and convenience. On the other level of the arena of disputes, tolerance and crossing mechanisms are negotiated. There are permanent accords and agreements from explicit and implicit negotiations between self-proclaimed businessmen (stock-keepers from Ciudad Hidalgo and importers from Tapachula), members of Concanaco and Servytur, customs and immigration bosses, union leaders, municipal governments, and local communications media. We cannot consider the businessmen and shipping people who participate in these negotiations to be small merchants who only experience the border, as in the case of Ms. Carmen; rather, we consider them to hegemonic actors in the sense of being organized pressure groups with the capacity to politically negotiate with the federal government. In the framework of the First Chamber Conference of the Southeast of Mexico and Guatemala, the president of the National Chamber of Commerce in Tapachula, Edmundo Olvera Cantera, highlighted that the authorities make the problem of the smuggling of goods between the two sister countries even larger by not giving information about export procedures to the businessmen, in addition to performing acts of corruption by extorting the traffickers. [… ] Similarly, he said that with this type of event with the participation of the authorities, there is the intention for them to show all the businessmen how they can bring in and take out goods legally and quickly. [… ] It is worth noting that, since yesterday and for the next three days, the chambers of commerce of the southeast of Mexico and Guatemala will have meetings with the authorities to find a way to make the exchange more flexible (Flores, 2009). As we can observe in this journalistic narrative, the government is held solely responsible for the environment of corruption that is experienced at the border. Curiously, the businessmen do not assume their complicity in the activity but rather present themselves as honorable businessmen who represent civil society. These businessmen claim to be the most affected by governmental decisions, which are imposed upon them from above, and therefore, they find themselves coerced into using clandestine methods. By following up with the mercantile flow of corn, observing it from the discourse of a group of corn traffickers on the border of Comalapa, Chiapas, and Democracia in Huehuetenango, Guatemala, Rebeca B. Galemba (2011) reports similar versions of what these businessmen express in the news articles. Despite the author’s good theoretical grasp, the field information collected validates how effective these traffickers of edible goods are, who “resist the hegemonic laws of neoliberalism” (Galemba, 2011, p. 367). We consider the interpretation made by both this anthropologist and the news article to be incorrect for approaching the complexity of the empirical analysis of the State, given that they do not observe that federal government officials on the regional level and these types of traders are always in negotiations and change their positions depending on circumstances. That is, they represent themselves in the area of dispute as antagonistic groups, but in reality, there are negotiations and cooperation between actors, with each seeking his or her own benefit (cf. Fletes, 2013b). In our empirical observations of the “businessmen,” we find a similar profile; they all belong to guilds that are incorporated into unions such as the CTM and the CROM and, in turn, are representatives of chambers of commerce on the regional level and, in some cases, were government officials for the border municipality. For this reason, in the public opinion and in their notes in the newspapers, they are conceived as custodians of legality. However, in their border-crossing practices, the accords established with the local State representatives to maintain the “flexibility for exchange” are evident. Legal Challenge to the Suchiate Pass!!! Alternate routes cancelled, affecting thousands of merchants. This was said in a working meeting in the Secretariat for the Development of the Southern Border and Connection for International Cooperation, in which those directly affected, represented by shippers and merchants, asked to know who was the official who authorized “The Coyote,” which is illegal, as the only path. And there was no answer. Those from the Coalition of Union and Social Organizations of Suchiate said, “We have exhausted the petitions, and we hope that they honor their promises; otherwise, we will take action to avoid preferences and to make the rules equal for everyone. And we support the people of the neighborhood of El Carmen, where they damaged and destroyed houses when evicting the merchants” (Cruz, 2011, p. A-8). The observations of the workings of these commercial flows from the Mexican side confirm the connections between officials, unions, and “businessmen,” just like other mechanisms of interaction through practices such as political clientelism, because these same businessmen are leaders or belong to unions or guilds that are related to political parties such as the Institutional Revolutionary Party. Although these businessmen strategically show the lack of State control over the border and, in doing so, justify the habitual crossing procedures, they are the individuals who reproduce the image of the State as a legitimate apparatus of control to which they can turn to solve their problems. In addition, by showing their discourses alongside their import practices, we confirm that this image is used if and only if it coincides or agrees with their economic interests and does not negatively influence their commercial ant-style trafficking practices. If we analyze the configuration of the State in both dimensions described above, in the first, we analyze how the interpretive community is based on personal relationships among government employees (state and federal), crossing facilitators (tricyclists, rafters, and divers), and small-scale vegetable traders. In these practices, the official judicial categories of crooked and straight are experimented with and reinterpreted on a daily basis and depending on circumstances. In this sense, the State system, viewed as the government, is based on personal relationships in which technical procedures for official trade crossings are interspersed with a local logic sustained in the morality of trading. The relationship between the operative personnel, facilitators, and these traders is built upon small boons that maintain the relationship between those involved and that foster the characteristic of a tolerant environment of the interpretive community. The second dimension appeals to legal flexibility in relation to the commercial fluidity designed by the negotiations between mid-level government managers and “businessmen.” Here, the State is a thin line of negotiation in which there appears to exist a totally antagonistic arena of dispute between businessmen and the government. The appearance consists of setting themselves up beforehand as antagonistic groups, in which the traffickers and self-proclaimed businessmen brand themselves as representatives of civil society, presenting their own economic interests as the interests of all border inhabitants on the Mexican side, in opposition to the inflexible State powers that do not understand the logic of the local context. In reality, this version of power relations betrays how that which belongs to the State is also generated by these power groups; therefore, its production is not exclusive to the State apparatus but rather stems from civil society. Paradoxically, it is not similar to what is commonly believed to be or idealized as civil society (that is, a group of citizens organized under democratic propitiatory channels of the rule of law in the name of all inhabitants who compose the national society); rather, within this category are hidden business power groups that attempt, through their discourse, to represent the voice of border civil society. Specifically, they are local businessmen whom we can categorize as tactical or organizational powers, following the typology of powers according to Eric Wolf (see Mintz, 1996, p. 53). Finally, we believe that what is called the State, based on the practices of border commerce, is not perceived as a centralized, depersonalized, and anonymous apparatus but rather is composed of “regional people”: the native people of the border towns. That is, they are part of the same civil society upon which the State order supposedly imposes itself. The implication is personal relationships placed within the actions undertaken by operative personnel in the name of the State. From these reflections, as Escalona analyzes in these micro-political environments, what exists is “a problematic combination between the political community (State) and civil society that makes the State appear to be something more than a bureaucratic-political-police apparatus” (Escalona, 2011, p. 50). The interpretive community and the de facto order created in the bosom of this border only further displays what Abrams (2000) observes in the workings of the state-system. That is, the state-system is not a coherent and centralized apparatus but rather a constellation of interests with relevant positions: an accord in which “the State” continues to be an entity legitimized by civil society, despite its inability to impose itself. The State is a result of political praxis, whose basic unit is based on the lucrative earnings of the ant-style trafficking on which hundreds of border merchants depend. 1The present study is based on the doctoral thesis of Hugo S. Rojas Pérez, titled “When commerce makes life: negotiated order, transfiguration of value and nationalism in the border context of Mexico-Guatemala,” presented at the Universidad Iberoamericana in February 2014. The study began in 2009, when some journalistic notes were collected. The ethnographic data were taken from his field work, conducted during all of 2011 and part of 2012 and 2013. Subsequently, in 2015, field work was conducted based on in-depth interviews directed by Héctor Fletes Ocón, mainly in Ciudad Hidalgo, where several federal and municipal government institutions have offices. 2Soconusco constitutes a historic region (currently composed of 15 municipalities), whose origins can be traced to Prehispanic Mesoamerica (Linares, 2010; Voorhies, 1991). In this period, the region spanned from the Isthmus of Tehuantepec (Oaxaca) to the current border with Guatemala (Aubry, 2006, p. 95). From that time, this territory was sought after because it was a strategic corridor for political and commercial communication between two natural and cultural regions in Mesoamerica, the western part (called New Spain) and the eastern part (the audience of the Confines; today, Central America), separated by the geological barrier of the Isthmus of Tehuantepec (Aubry, 2006). Its particular condition of transit and the seats of indigenous towns in this period were modified during colonization by delimiting its assignment to the Command of the Military District of the Kingdom of Guatemala, not re-integrating into Chiapas and Mexico until the mid-19th century (Castillo, 2002). 3These goods are carrots, onions, cabbage, lettuce, tomatoes, and tubers such as potatoes. Small traders traffic quantities between 200 and 300 kg every third day. With regard to transporting vegetables across the border wholesale, beyond calculating what is transported by raft, we performed a count of the freight transport that distributes these goods exclusively to the San Juan market, the largest in Tapachula, during the entire month of May 2011 and one week of March 2015. We observed freight trucks of 3 and 3.5 tons distributing vegetables five days per week. Of these quantities of vegetables, we observed a decrease during the rainy season (August, September, and October) and an increase in the month of December. 4The local passes are the FMVL (Local Visitor Migratory Form–Forma Migratoria de Visitante Local) and the FMTF (Border Worker Migratory Form–Forma Migratoria de Trabajador Fronterizo). The FMVL is the migratory form that allows the admission of Guatemalans to visit border populations in Mexico for up to three days (Acuerdo que tiene por objeto establecer las reglas conforme a las cuales se otorgarán facilidades migratorias a los visitantes locales guatemaltecos, 2008). 5It is worth noting that the constant observation by different official actors of the sanitary aspect of Guatemalan vegetables is linked to the application (always resisted and reconfigured) of a package of terms and health regulations for different products in the Soconusco region on the Mexican side. The official phytosanitary vigilance is a historical process (since the first quarter of the 20th century) of relationships between official actors and the business and farmer agricultural actors for products such as coffee, bananas, cotton, and mangos (Fletes, 2013a). ☆ Hugo Saúl Rojas Pérez. Mexican. PhD in Social Anthropology from Universidad Iberoamericana, Ciudad de México. SNI Candidate. Currently is in a postdoctoral stay in the Doctorado de Estudios Regionales de la Universidad Autónoma de Chiapas. Research areas: identity, border and alimentation. His recent publications include: “Cercanías distantes; un análisis de las clasificaciones culturales alrededor del comercio de hortalizas guatemaltecas en México” and “Soltería masculina, familia y ciudadanía en dos pueblos de origen nahua del valle de México”, with Aki Kuromiya. ☆ ☆Héctor Bernabé Fletes-Ocón. Mexican. PhD in Social Science with especiality in Social Anthropology in the Centro de Investigación y Estudios Superiores en Antropología Social-Occidente. Master in Regional Development in Productive Restructuring. Currently works in Universidad Autónoma de Chiapas, San Cristóbal de las Casas, Chiapas. Research areas: State and food globalization. Recent publications: Editor of the book Desarrollo local en México: Iniciativas y miradas en diferentes territorios (2016), and author with Alessandro Bonanno of the article “The processing of palm oil in Chiapas, México: resistance and alternatives”, in A. Bonanno & J. S. Barbosa (Eds.). Labor relations in globalized food, Emerald, (2014).